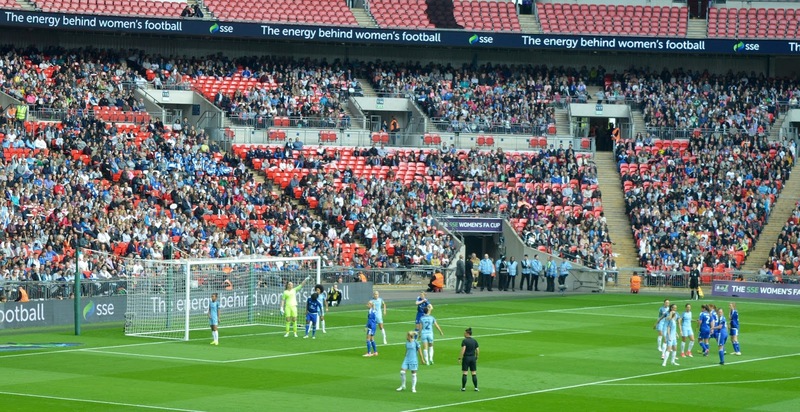 If you follow us across any Social Media you may have noticed that we popped down to Wembley Stadium to watch the SSE Women's FA Cup Final last weekend. This was a massive deal for us and catching an early morning train down to London for the weekend was definitely worth it. As a child, the small business my dad worked for had a pool of NUFC season tickets that were shared between staff. My dad was able to attend pretty much every home game and myself and my younger brother would take it in turns to go along with him. Nothing beats the atmosphere of an NUFC home game when we're winning and I used to adore tagging along. It was in the glory days of Shearer, Ferdinand, Asprilla and Beardsley and watching them play was absolutely the highlight of my weekend. I specifically remember the day that my love of the game changed a bit and this was when NUFC were playing Liverpool at home. I couldn't wait to watch 'young' Michael Owen on the pitch and was a bit of a fan. We were big rivals at the time and I was really looking forward to what was all set to be a fantastic match. Unfortunately, my dad had other plans and although it was my turn to tag along with him, my dad opted to take my brother instead 'because he was a boy and would enjoy a big game like this more than me'. His words not mine! Oh how I cried that day and to be honest, football was never the same for me. Fast forward to meeting Steve in my late teens and his family are HUGE football fans. I remember the first time I met Steve's mum she said to me that I'd better like football as if I didn't, I wouldn't fit in. Luckily I did and i fit in just fine. Steve's mum, dad and Steve were all season ticket holders back then and if they weren't at St James' Park watching a match, they were at home watching the football. So football has always pretty much been a strong part of our lives. With this in mind, it might shock you to hear that we've never taken our own children to watch a football match and to be honest, I'm not really sure why. So our trip to Wembley with Harry and Heidi was going to be their first ever experience of watching the beautiful game live at an elite level. 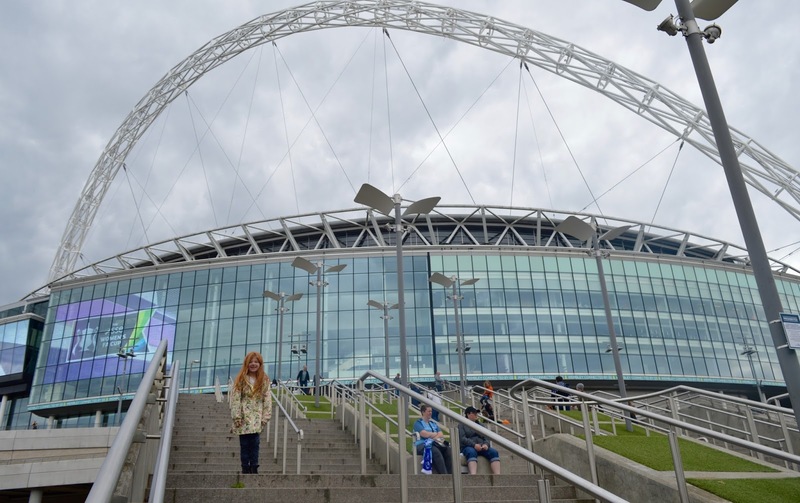 I wasn't expecting it to be too busy if I'm honest and was slightly taken aback to see the area around the stadium packed with girl's football clubs, football fans and families enjoying a day out. We found our seats in the stadium and learned that there were over 35000 people watching the match with us. 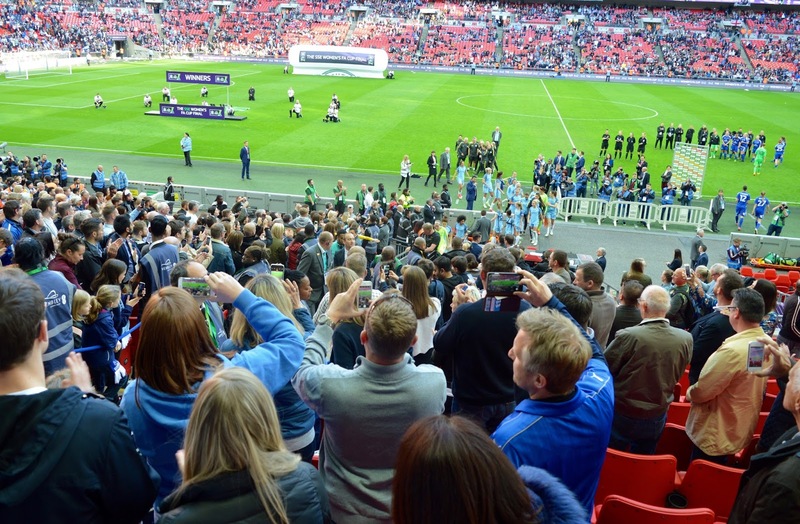 It was a record-breaking attendance and we were chuffed to be part of that. As the match kicked off, I was pleased to see that the referee and match officials were also female. As we're from the North, we decided to support favourites Manchester City and it wasn't long before we were all jumping out of our seat, shouting and cheering along. We all really got into it! The atmosphere was electric and perfect for families. I didn't hear any swearing like I did in the old days back at St James' Park and the family in front of us shared their blow up banners around with the seats around them which was nice. 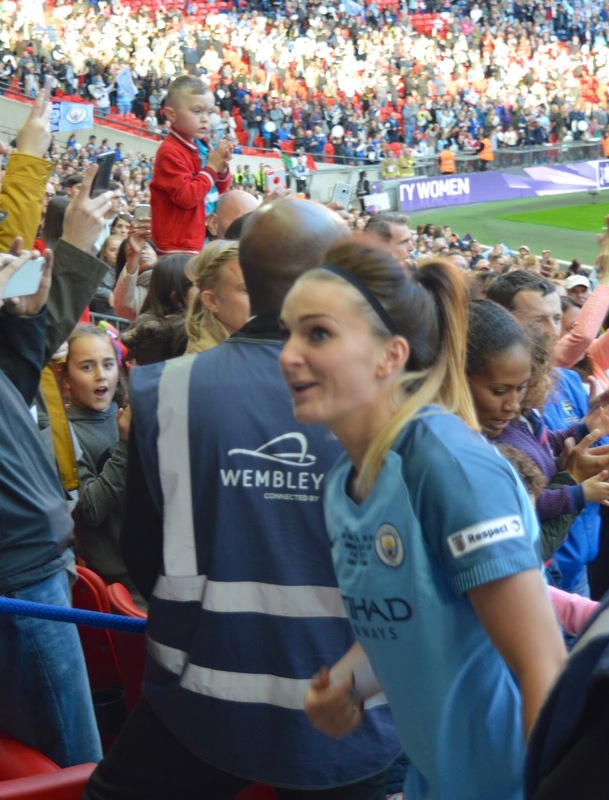 I wondered if watching Women's football would be any different to watching men play and Steve and I both agreed that there wasn't much difference at all. The ladies were all super talented, in their prime and fantastic role models to all of the impressionable young girls watching from the stands. If anything, I noticed that there was no diving or bad behaviour like there sometimes is in the men's game and Steve mentioned that there was a very tough tackle at one point and a player went down. She was helped straight back up again though and just got on with the job. Steve said if that had been in the men's game, he imagined there would have been far more drama, rolling around and a physio called onto the pitch. 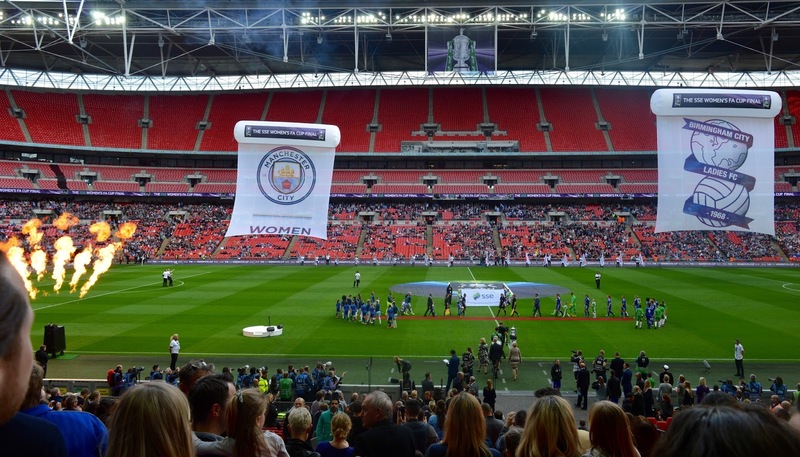 If you want to watch real football, put any pre-judgement you have behind and honestly, try attending a women's game and you'll notice the difference yourself. I spend my life explaining to Heidi that she can do anything she sets her mind to - a doctor, astronaut, scientist, computer engineer.....anything! She currently wants to work in mountain rescue and I'm proud of that. I asked her at half time if she'd like to try football too and it was a definite yes. The next day we popped into Hamley's and bought Heidi her own football which she's played with non-stop ever since. The game was fast paced and our team had a comfortable 4-1 win (yeah). It was all taken in good spirit though and to be honest we cheered just as loudly when Birmingham scored as when Manchester did. 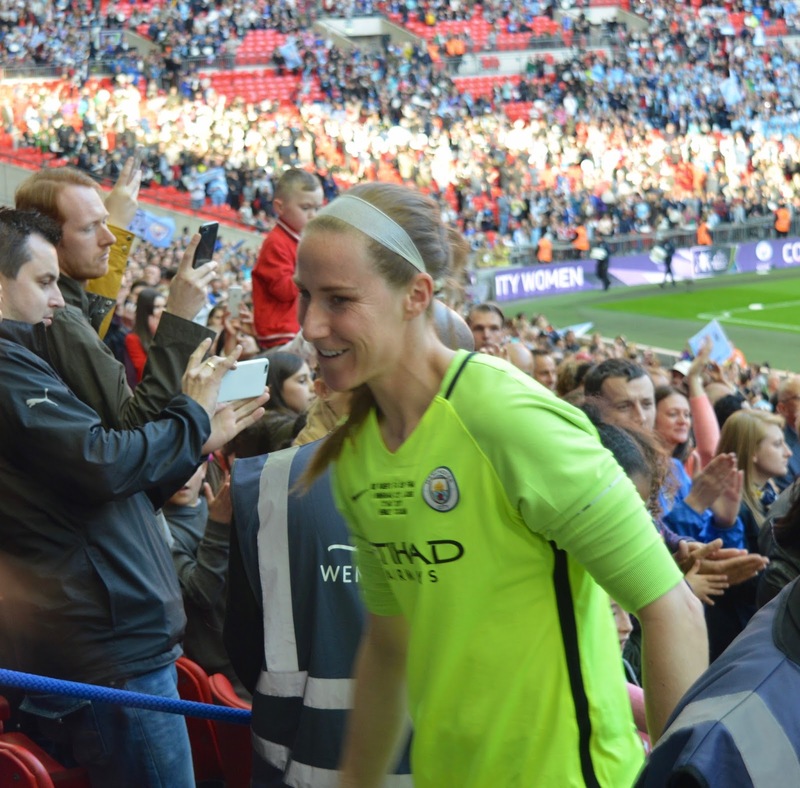 Heidi had managed to get herself a prime seat and as the players walked past to collect their medals, she managed to hi-five a few of them. She was proud as punch and I can't explain how pleased I was as a parent to see Heidi looking up to and admiring these women. Proper role models! When Manchester City lifted the cup the crowd went wild and I honestly felt a little emotional. Harry and Heidi were both cheering and jumping up and down and I think it will be one of those moments I remember forever. Well done ladies for making us proud! Sunderland AFC Ladies play their home games at Hetton Centre in Houghton Le Spring and tickets are a bargain at just £4 per adult, £2 per child or £10 for a family of 4. We certainly want to see more and will be attending a Sunderland AFC Ladies home game this weekend - we hope to see you there! You can book tickets online here. It looks set to be a family atmosphere with FREE bookable football skills sessions for kids before the game and the creation station will be in attendance to allow fans to create their own banners and masks. Going back to my own experience as a child for a moment, I don't want anyone to ever tell Heidi that she can't enjoy something just because she's a girl and feel like I did. I truly applaud the FA's efforts to encourage girls into football and will do my best to support Heidi in playing and watching the game for as long as she's enjoying it. 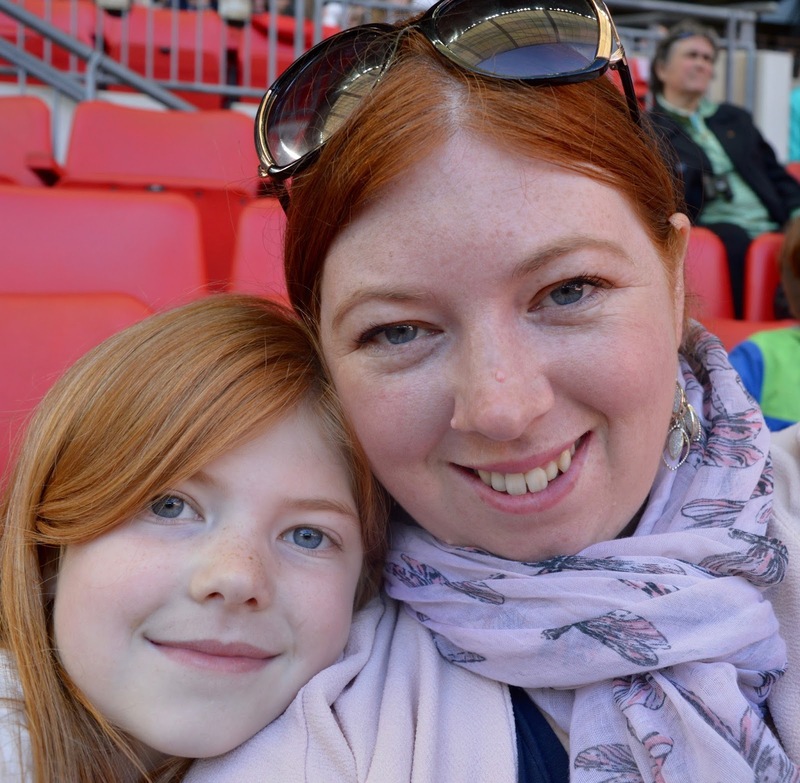 When you take part in a blogging campaign that genuinely has such a positive impact on your family, it is such a good feeling and that's how I feel about the FA Women's Super League. 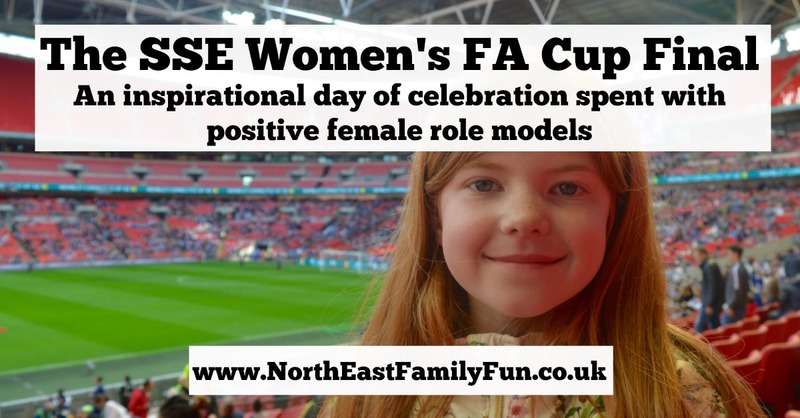 The FA have a number of schemes in place to encourage girls into the game from Girls' Football Week to SSE Wildcat Girls Football Clubs. Heidi will be taking part in a few different activities over the next few months so keep your eyes peeled. Disclosure | I am working on a paid basis with Britmums and the FA as part of this campaign. All thoughts, words and football enthusiasm are my own. Fab post Sam! I hope Heidi gets a real passion for the game just like the rest of the ladies in our family! Emily loves watchi g Nick Kicks,so theres aa little bit of i terest there already and weve been to a couple of games at SJP! And I'm proud to sport the former ladies England captain's name now I'm a Smithy!! I haven't heard of Nick Kicks! Will google it! I love how you are such a football mad family and this was the first time you'd taken your children to see a game. It's wonderful that your daughter is so inspired - what an atmosphere that must have been! I could feel the excitement as I read your post! It's interesting having friends in the States with daughters because they are so into soccer (football) from a very young age. It's just the done thing over there! What a brilliant experience for Heidi. Had she ever been to a match before? Love your photos. You look like you all had a fab family time. No she'd never been to a match before - how lucky that her first match was a cup final at Wembley! What a brilliant and inspiring day. There's nothing quite like watching live sport to get the adrenaline going and spur you on to have a got yourself! LOVED reading this. Shamefully I'd never really given women's football a second thought despite being a huge football fan in my teens - I used to go to every Norwich home game, my bedroom was covered in football posters and my Dad and I would watch the football together on TV every weekend. I fell out of love with it when I grew up and had other commitments that meant I couldn't get to Carrow Road to watch the Canaries. Definitely going to try and catch a game soon! It sounds like you all had a great time Sam! My daughter likes football but her big brother couldn't care less! 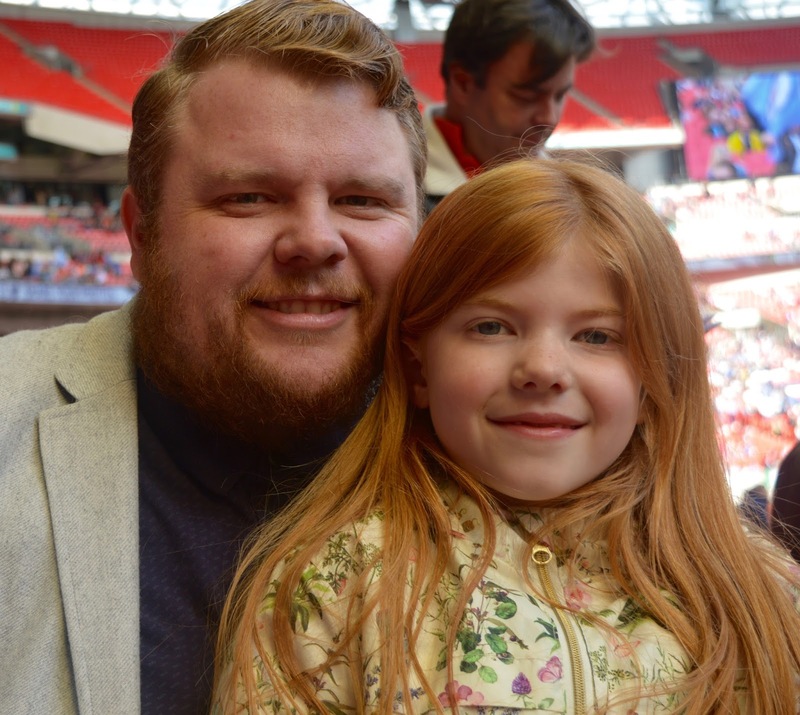 She went to her first Sunderland game with her dad this season and loved it. I've never thought of taking her to see SAFC Ladies though so might try and catch them before the end of the season. What a fabulous treat for a football mad family! It's so lovely that Heidi was so inspired by the fabulous women playing on the day too (and how great that she got to high five them!). Oh that story with your brother going and not you made me really sad! It was such an inspiring day and lovely to meet all of the ambassadors as well! 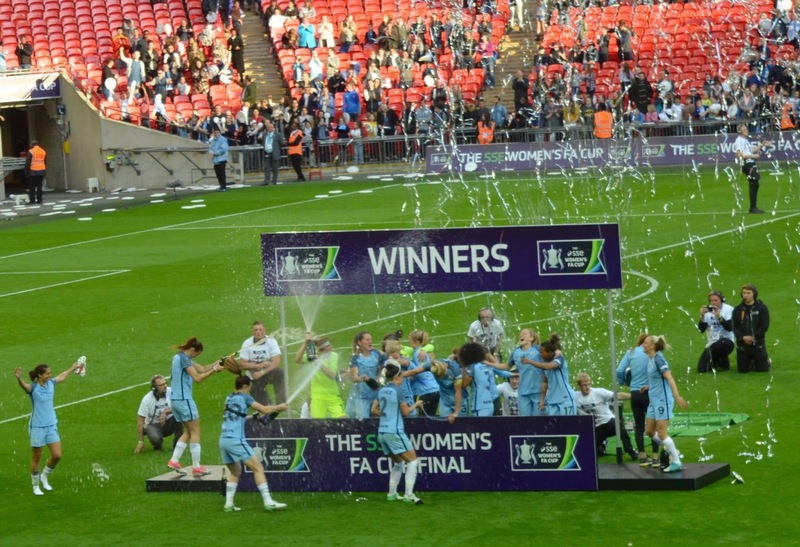 Let's hope we can inspire more girls and women to give football a go! 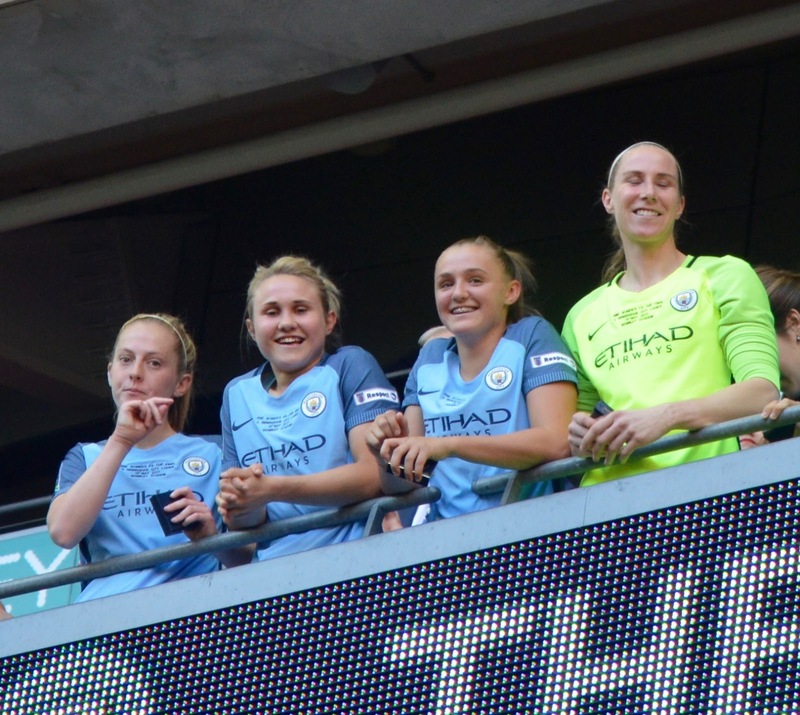 I'm looking forward to reading more - love your pics too, you've got some great ones of Steph Houghton and Karen Bardsley! !